An automated external defibrillator, or AED, gives spoken prompts to provide guidance to an untrained operator to give potentially life-saving first aid treatment until an ambulance or paramedic can reach the scene of the incident. This can be vital in remote, rural locations where the difference between life and death can be down to getting the proper medical treatment at the right time. Many communities are now using an adopted telephone kiosk to house an AED. In 2008 British Telecom (BT) introduced its 'Adopt a Kiosk' scheme. With increasing mobile phone ownership and better coverage BT found that the number of people using the public telephone box network was declining rapidly. With many kiosks across the network effectively redundant BT looked to get community support to handover care of these kiosks to local communities, if they could develop a local project to find a new use for the kiosk. A K6 Medical Centre kiosk uses an existing adopted BT kiosk. Externally they are little different to traditional K6s. Where kiosks are unlisted by heritage bodies communities are able to alter the signage as illustrated above. Internally, the telephone equipment is removed by BT ande replaced by an AED. These differ in design and size, but typically these are a bright yellow cabinet. All are identified by the standardised international ICLOR defibrillator symbol (a green heart with a 'shock' symbol and white cross). The electricity supply may require adaption to provide power to the AED. The AED provides spoken commands to an operator, with visual instructions also provided on the exterior of the AED cabinet. There are different providers of AEDs in the UK, and many are installed in public locations so than the general public can access the AED. AEDs are installed in shopping centres and cinemas, as well as telephone boxes. They are designed to be used by operators without medical training, by provided spoken guidance to operators, and simple visual instructions that are provided on the AED cabinet. The Community Heartbeat Trust (CHT) is a charity that works with BT to enable communities to adapt their adopted kiosks to house an AED. Used correctly an AED can provide emergency medical treatment until such time that an ambulance or paramedic can arrive. Installation of an AED shall only be undertaken with the support of an organisation like the CHT, as there are electricity safety standards that shall be adhered to when installing an AED. The CHT provides a governance system to communities that demonstrates the proper management of the AED. An adopted kiosk provides a sheltered place for an AED cabinet, and its bright red colour makes them stand out in their environment. The CHT website provides useful information and guidance for communities looking to have an AED installed in their adopted kiosk. 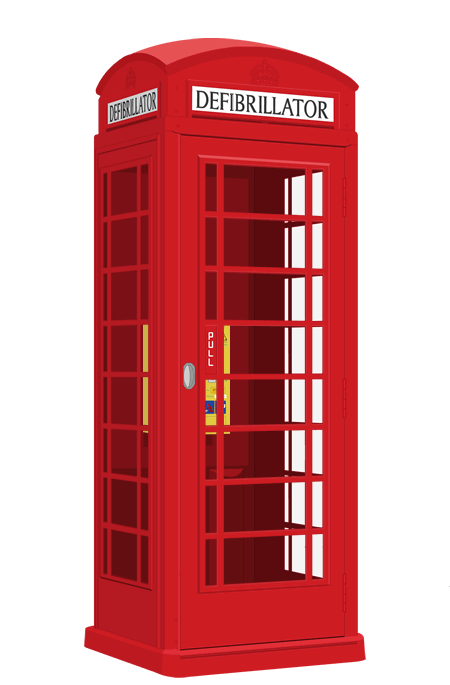 The declining use of the telephone box has posed a challenge for BT, as operator of the public telephone network, and communities and heritage campaigners looking to preserve the red telephone box. The Adopt a Kiosk scheme has seen over 4,000 communities adopt a telephone box since its inception in 2008. 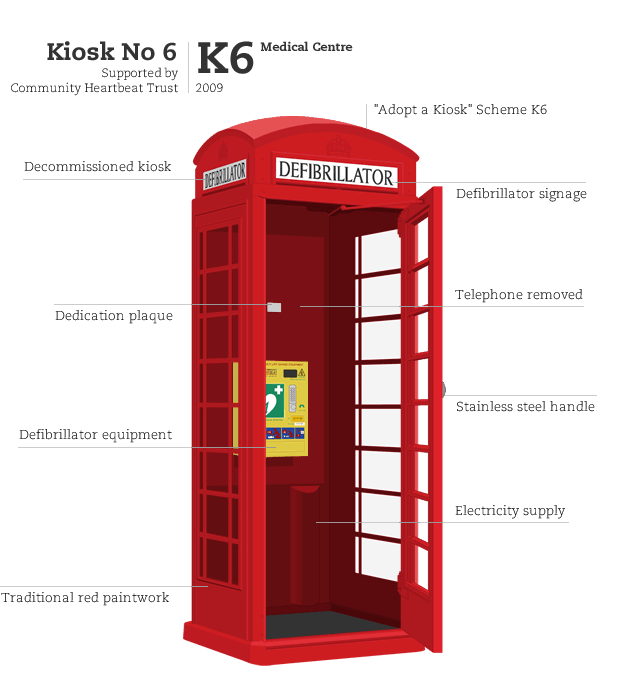 The use of kiosks to house an AED is one such example of a successful scheme, others include information points, local lending libraries and miniature art galleries. All these communities should be applauded for helping save this much loved British icon.